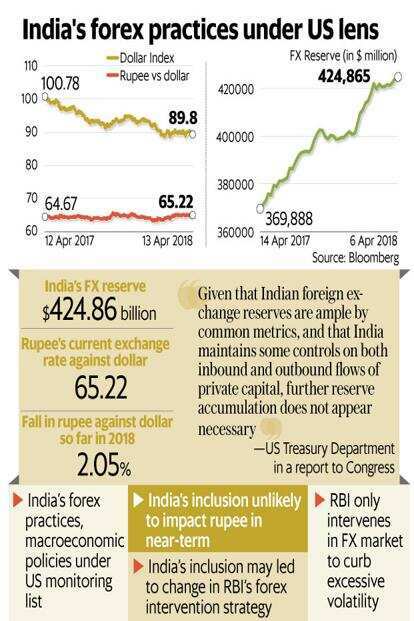 Mumbai: Inclusion of India in the US monitoring list for its foreign exchange and macroeconomic policies is unlikely to exert further pressure on the rupee in the near term, currency dealers said. The US department of treasury submits a semi-annual Macroeconomic and Foreign Exchange Policies of Major Trading Partners of the United States to Congress, highlighting currency practices of major trading partners of the US. On 13 April, the US added India to the list, which now has a total of six countries including China. “The step reduces RBI’s capability to intervene in the forex market at the time of buying dollars and prevent strength in the local currency. Currently, the rupee is on a depreciating mode because of various factors, including global geopolitical risk and such RBI’s intervention to buy dollars is ruled out," said Sajal Gupta, head, forex and rates, at Edelweiss Securities Ltd. According to currency dealers, external volatility, with rise in US bonds yields, oil prices, geopolitical concerns and a threat of trade war has led to the dollar strengthening and the rupee weakening. Slowing inflows into local financial markets and the widening current account deficit have also contributed to the weaker rupee. So far this year, the rupee has weakened 2%, while foreign investors have bought $1.92 billion and $504.60 million in equity and debt markets, respectively. In 2017, rupee gained 6% mainly on due to good inflows both of foreign direct investment and portfolio investment. This led to the active intervention of the central bank in the market to sterilize dollar flows. Accordingly, forex reserves rose. Currently, India’s foreign exchange reserves are at all time-high of $424.86 billion. The US uses three criteria to pick candidates for the list. First, the bilateral trade surplus with the US must be at least $20 billion. Second, the current account surplus must be at least 3% of the gross domestic product (GDP). Third, there must be persistent, one-sided intervention where net purchases of foreign currency are conducted repeatedly and such total is at least 2% of an economy’s GDP over 12 months. To calculate persistent intervention, the department will consider if there has been net foreign exchange purchases for eight of the 12 months. A country meeting two of the three criteria is placed on the monitoring list. “India increased its purchases of foreign exchange over the first three quarters of 2017. Despite a sharp drop-off in purchases in the fourth quarter, net annual purchases of foreign exchange reached $56 billion in 2017, equivalent to 2.2% of GDP," the report said. It added that India has a significant bilateral goods trade surplus with the US, totaling $23 billion in 2017, but India’s current account is in deficit. Given the current context, the impact on rupee is unlikely. But it may have reputational impact and could lead to change in RBI intervention, according to currency dealers.